A remarkable galactic event took place on January 6, 2002, one that had never been observed before. Deep in the constellation Monoceros — the Unicorn — a previously unknown star suddenly brightened, just like a nova. Nothing unusual about that, except that instead of gradually dimming out as a nova would, it faded somewhat and then brightened again two months later. And again, in April, a third burst of light, even more brilliant, a million times brighter than our own sun. At the same time, the star expanded to a diameter equal to the diameter of Jupiter’s orbit. If this had been a nova, the star would have contracted in size, expelling matter and energy in one tremendous burst. But the light patterns from V838 defied any simple explanation, and in fact astronomers are still uncertain as to the cause. Despite appearances, the amazing progression of photos taken by the Hubble Space Telescope does not depict matter being blown away from an exploding object. 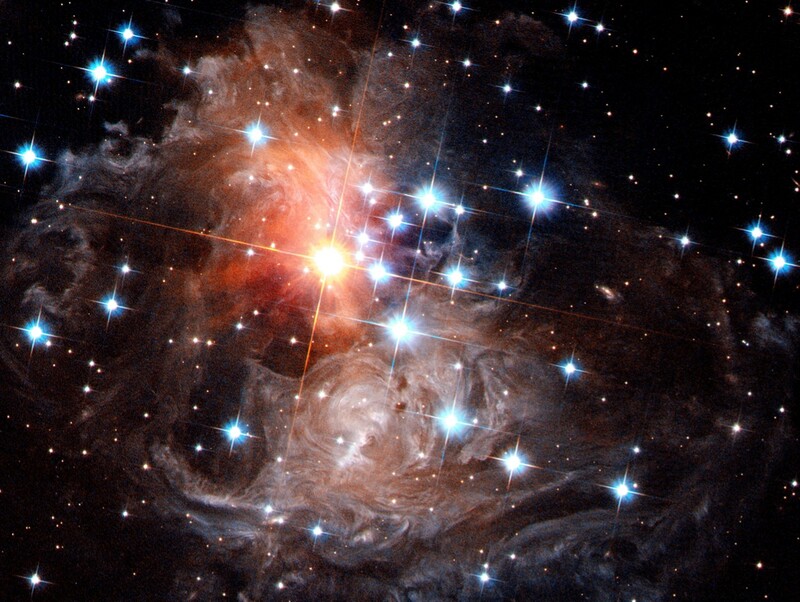 Instead, what we are observing are the reflections of infrared light on clouds of dust particles that happened to surround V838 at the time of the event. 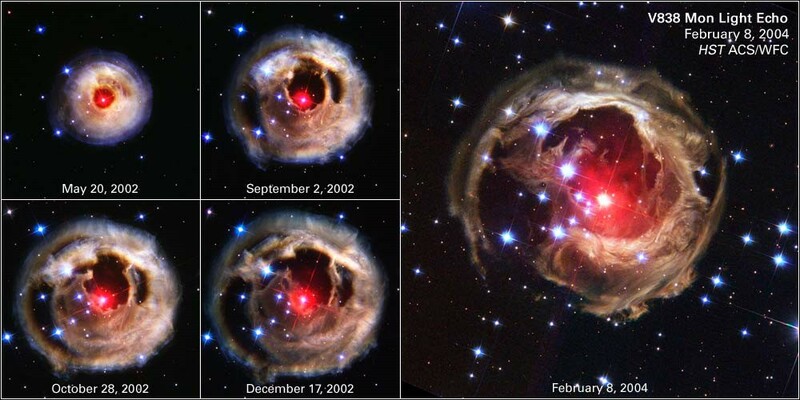 In the final Hubble photo shown below, the remarkable sphere of dust has largely dissipated, leaving a remnant very similar to what one would expect of a nova, but the giant red star is still clearly visible in the midst of it.